First comes love…then comes marriage…then comes a baby in a baby carriage.” We’ve all heard this saying. In fact, Elizabeth lived and planned her life by this children’s nursery rhyme. What happens when life doesn't go according to plan? What happens when the life you created falls apart? How do you pick up the pieces? When do you finally realize what life handed you is indeed perfect, even if it was never part of your plan? Elizabeth “Beth” Thomas is a thirty year old senior associate at a law firm. Married to her college sweetheart, Grant, they have traveled, built their dream home, and are ready to become parents. They struggle with infertility. Grant wants a normal life again. He wants to go back to the way it was before trying to have a baby consumed their lives. Once they agree to go back to a “normal” life, life hands over a different plan for Beth. Beth struggles with loss and heartache. She leans on her family, her two best friends, and her doctor. 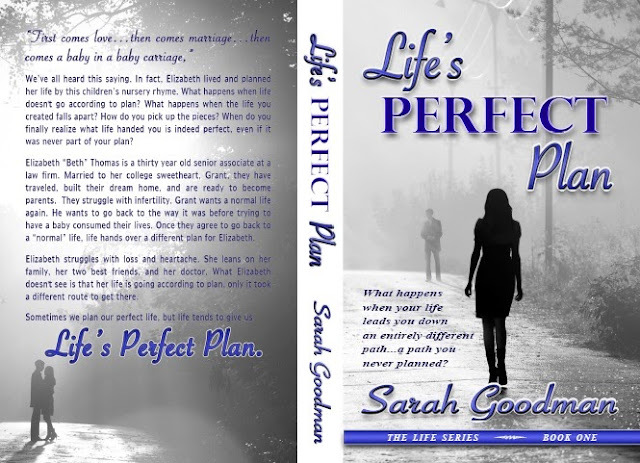 What Elizabeth doesn't see is that her life is going according to plan, only it took a different route to get there. "Sometimes we plan our perfect life, but life tends to give us life's perfect plan.